A pair of black high top chucks are music to your feet. With apologies to Elvis and Carl Perkins, there was always something hinky about those “Blue Suede Shoes." Whaddya mean, you can’t step on ’em? Rock ’n’ roll footwear has to be able to take a licking. That’s why combat boots, Dr. Martens and “My Adidas” have all retained their popularity with musicians. 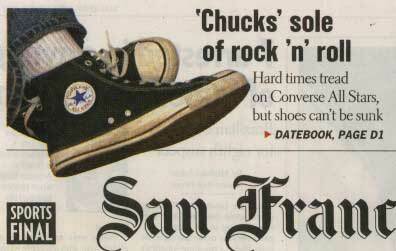 But none of them say “rock ’n’ roll” quite like the canvas Converse All Star, otherwise known as the Chuck Taylor. When the Converse company filed for bankruptcy protection early this year, record collectors of all ages swallowed a collective gasp. Rumor had it that the sneaker of choice for the Ramones, Kurt Cobain, Eddie Vedder, Green Day and Wayne and Garth from Wayne’s World would soon be a thing of the past. Panicky connoisseurs sparked a run on the sneakers. “We freaked out!” said Donna A. of the San Francisco girl group the Donnas, who have an unofficial sponsorship deal with the company. “My friend and I both bought two or three pairs,” said Randy Clark, a San Francisco musician who was tromping around a muddy Pacifica lot in black Chucks last weekend, looking for a Christmas tree. It’s unthinkable that this universally recognizable shoe, the oldest and best-selling sneaker of all time, could go the way of the Beatle boot and the 6-inch platform sole. Earlier this year, though, that seemed like a distinct possibility. As it turned out, Converse licensed the Chuck Taylor design and familiar logo to a company called Footwear Acquisitions, which has since taken over the struggling shoemaker. All Stars, one of the last prominent brands that could still claim to be “Made in America," are now manufactured in Indonesia. The overseas move was a disappointment, he said — “It was part of the allure that they were still made in the U.S.A., at a reasonable price” — but not enough to dampen his happiness that the shoe is here to stay. First introduced in 1917 and endorsed by the Basketball Hall of Famer Chuck Taylor (not to be confused with the late Stanford football star of the same name), “Chucks” have a long and glorious history as an American icon. Army recruits trained in them during World War II. By the 1960s, with All Stars on every gym floor in America, Converse could claim 80 percent of the sneaker market. The company says it has produced more than 575 million pairs. Wilt Chamberlain was wearing Converse when he scored 100 points in a game. TV’s Dennis the Menace and Richie Cunningham wore them; so did John Belushi. As for rock ’n’ roll, the shoe has an endlessly renewing legion of devotees.The members of the Strokes, rock ’n’ roll’s latest it-band, wear chucks. Classic punk bands like the Dead Boys and the Voidoids wore them. Hair bands of the 1980s such as Loverboy and Quiet Riot were partial to black chucks, while the Mighty Mighty Bosstones like the specialty plaid model. Ironically, webmaster Peterson said, the sneaker’s counterculture appeal might have contributed to the decline of the company. Chucks have even surfaced in the world of haute couture, where designer Marc Jacobs wore a bright pink pair and featured custom high-heeled Chucks in his collection at a recent Paris show. With that kind of endorsement, the sneakers have been selling briskly at the ultra-hip Parisian boutique Colette.